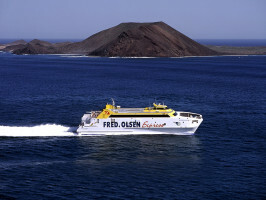 Spend a day in the neighbouring island of Fuerteventura on this fantastic ferry trip. 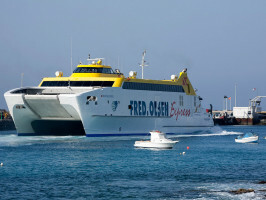 Cruise from the port of Playa Blanca in Lanzarote across to Corralejo in Fuerteventura. The crossing only takes between 20 and 25 minutes and there are 14 crossings a day. What better way to spend your holiday than getting acquainted with not only one of the seven islands but two! Set out on the Atlantic Ocean to make your way over to the idyllic island. Check out Fuerteventura which is just a stone’s throw away from Lanzarote and see for yourself if the island is as quiet as they say it is. There are lots of beaches that you of course are more than welcome to make your way along to. Corralejo started out as a traditional fishing village and has since become a modern holiday resort boasting over 11km of golden beaches and sand dunes just a short trip from the town centre. There are plenty of places offering a bunch of different water sports like scuba diving and kayaking. If you want to get even more peace and quiet, the small uninhabited island and nature reserve of Lobos is just a short ferry ride away and is well worth a visit. If you’ve picked the safari option, this is valid for one vehicle and the driver so the rest of the passengers should choose the transfer option. The driver needs to bring along the vehicle registration number. If you take your car, you can get around the island and see more of what’s on offer without relying on public transport. Lanzarote - Fuereteventura: At 7.10am, 8.30am, 10am, 2pm, 4pm, 6pm and 8pm. Fuereteventura - Lanzarote: At 6.30am, 7.50am, 9am, 12pm, 3pm, 5pm and 7pm. Please ensure you arrive at the meeting point at least 45 minutes prior to the tour start time. 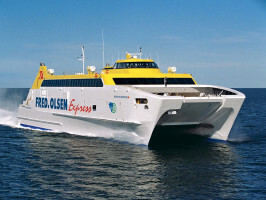 End point: Please let the supplier know at what time you will return by ferry. 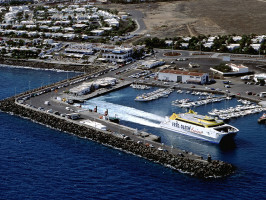 Please go to: Playa Blanca harbour. Meeting point 45 minutes before the tour starts. Voucher validity: Voucher valid for the date of the service only. Remember to bring the voucher and valid photo ID with you. If you’ve picked the safari option, this is valid only for one vehicle and the driver only so the rest of the passengers should choose the transfer option. The driver needs to bring along the vehicle registration number. If you take your car, you can get around the island and see more of what’s on offer without relying on public transport. Please make sure that the selected rate corresponds to the applicable rate for the region of your residence. Neither Hotelbeds (nor any other member of the Hotelbeds group of companies) will be responsible if the supplier of the service being purchased denies access to the service because the selected rate is incorrect. In case of emergency please call the emergency telephone number+ 34 971211601 (Languages spoken: Spanish, English).